A Big Thank You from Jackie! 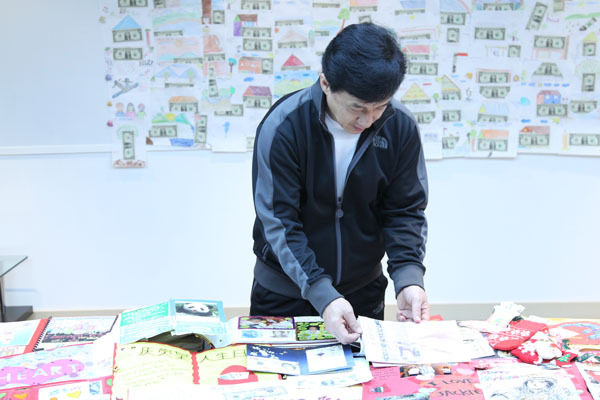 When Jackie returned to Hong Kong earlier this month, he was thrilled to see that his staff had displayed donation drawings from fans all over the world. He was so happy and excited and wanted to make sure that everyone who donated knows how much he appreciates what you've done. 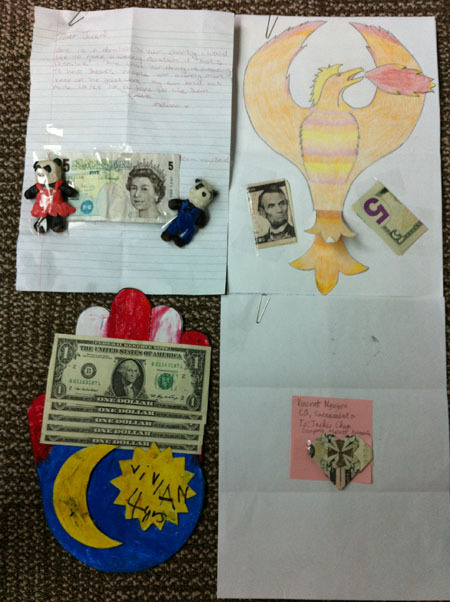 So he asked us to take some photos of all the wonderful things sent in by fans this year. The total donations for this month amounted to a whopping US $2,634 !!! Since Jackie matches all donations, the new total for the third Build a School project is now US $30,222. We are nearly halfway to our goal! 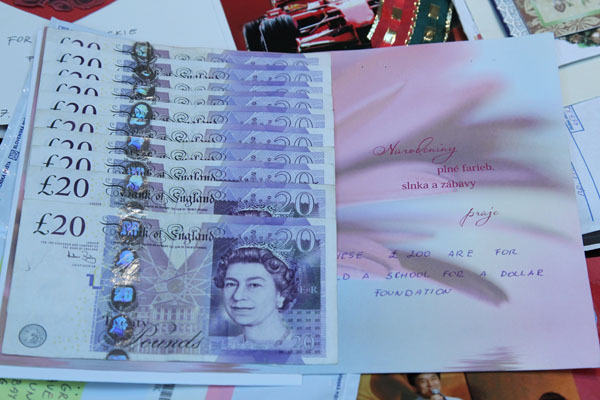 Here are some photos of Jackie, followed by some photos of the donations that were sent in. Jackie also wants to thank people who donate through his website. Those donations mean just as much as the ones sent to his office! 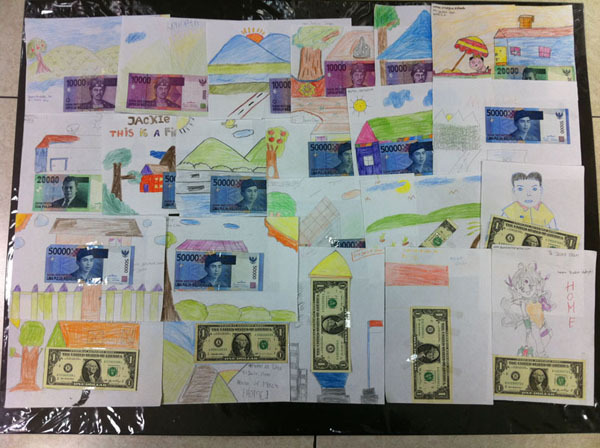 Remember, Jackie sees each and every donation drawing that is sent to his office. Even though it might take him a while to look through them, he does look at them and he saves each one to display in his museum some day. 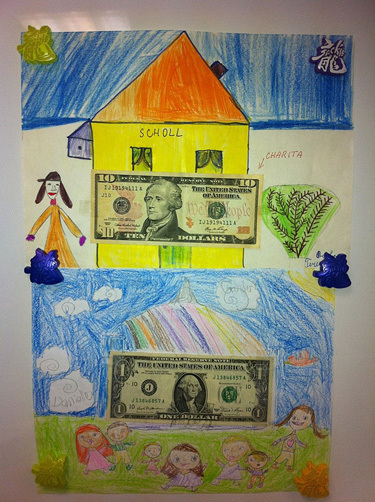 For more information about the Build a School donation drawing program, click here. 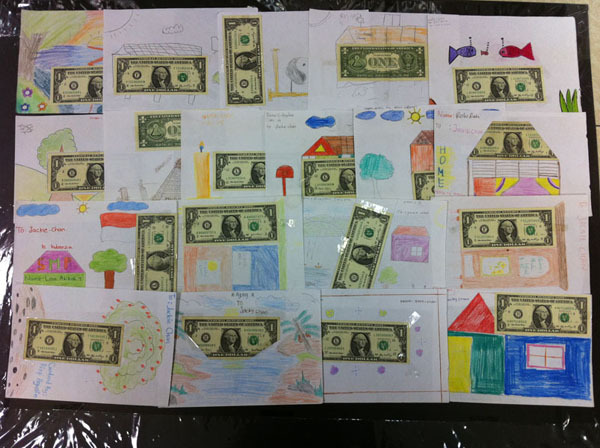 This month we added over $600 to the Build a School fund and now we are getting very close to $25,000. 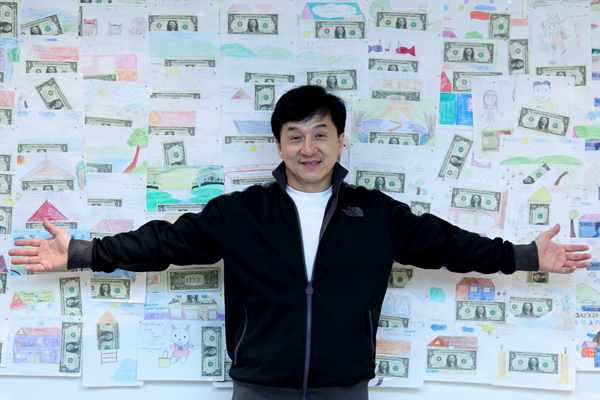 Remember kids, you can send in a donation drawing for Jackie to see and don't forget that he will keep all donation drawings to hang in his museum. So you get to make a great drawing and you get to help people too! 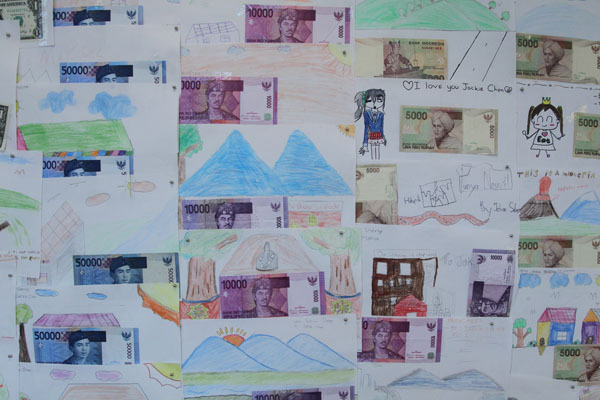 The Build a School for a Dollar project really needs your help. 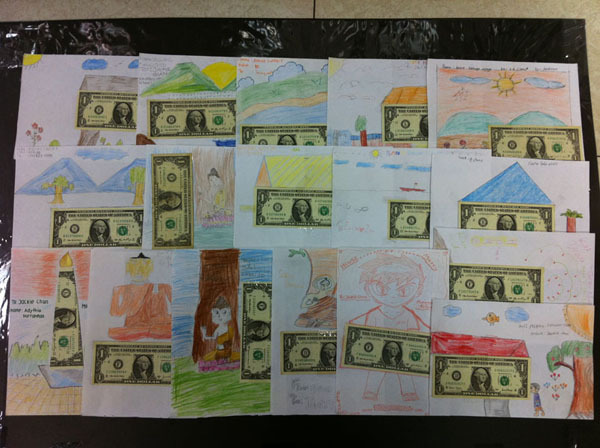 We only received a few drawings this month. 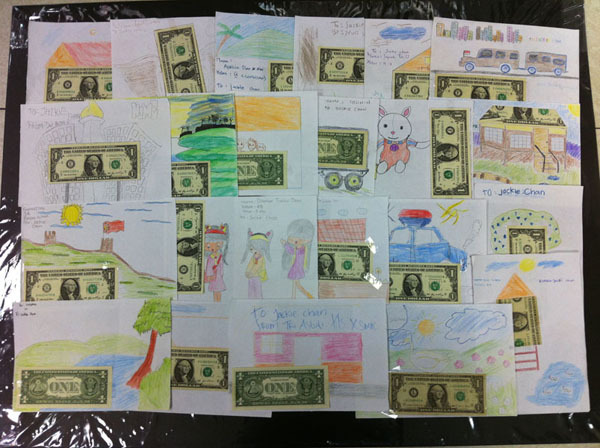 We'd love to receive more! Click here to read about how easy it is to be a part of one of Jackie's favorite charitable projects. Congratulations to all the Round Two winners! 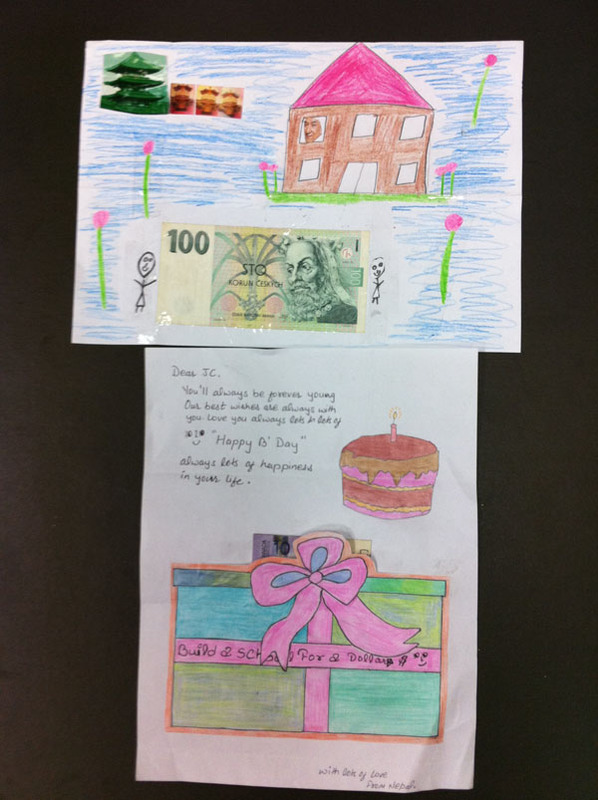 Thank you to everyone who contributed to Jackie's "Build a School" project over the past few months. The total is now a whopping US $23,466. 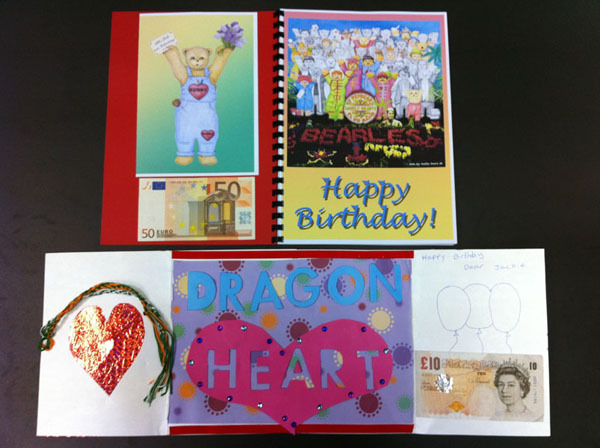 This means that we are nearly one third of the way to raising enough money to finance a third Dragon's Heart School in China! If you would like to donate to Jackie's charity and have fun at the same time, click here to learn how to do it. 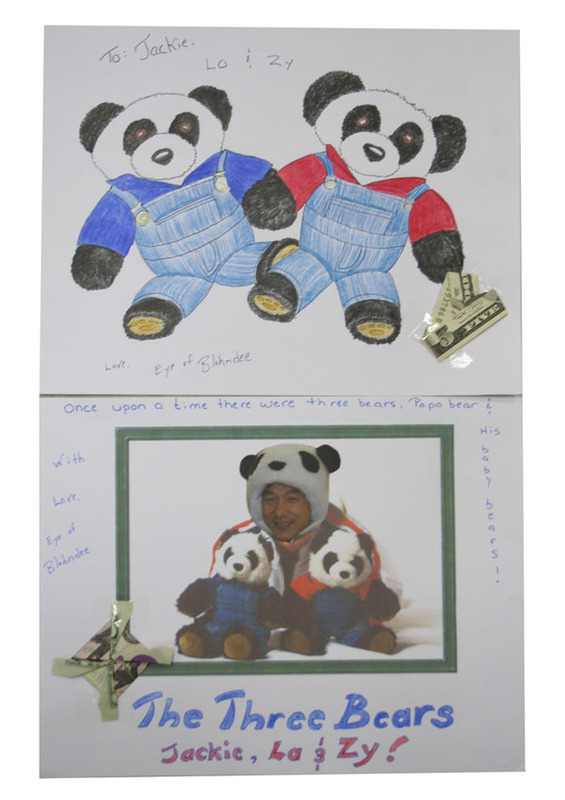 Creating the donation drawings is a fun way to make a donation and remember, Jackie keeps all of the drawings sent by fans so he can hang them in his Jackie Chan Museum! Thank you again to everyone who has sent a donation drawing or has donated online. We appreciate every penny! Jackie Chooses Happy Chinese New Year Contest Winners! 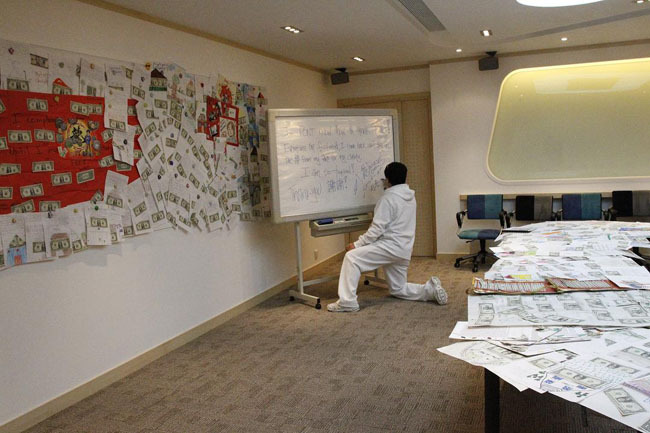 Here's a photo of Jackie choosing the winners in the 2011 Happy Chinese New Year contest. Congratulations to all winners and thank you to everyone for entering. 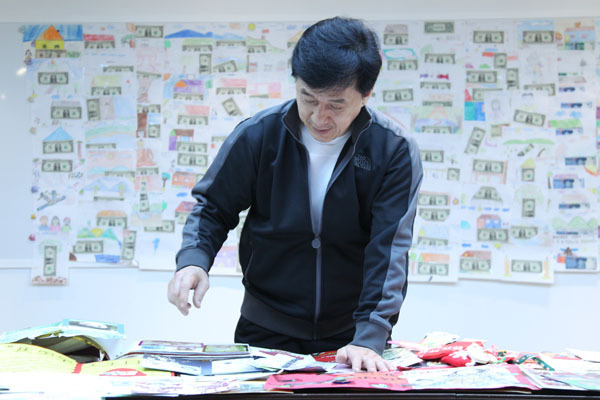 Jackie enjoyed picking out the winners and commented on the creativity of all his fans! 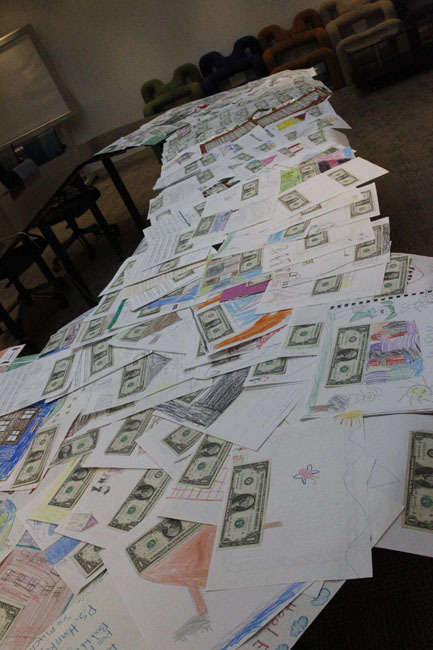 There were nearly two hundred entries in the New Year contest. Thanks to everyone who sent in a design! Several designs were added today after they were discovered in an email SPAM folder. Apologies to anyone who was worried about his or her design. 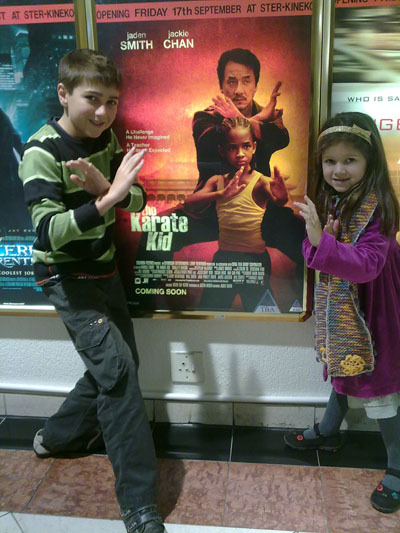 If you sent a design and don't see it posted, please resend to jckids@jackiechan.com. 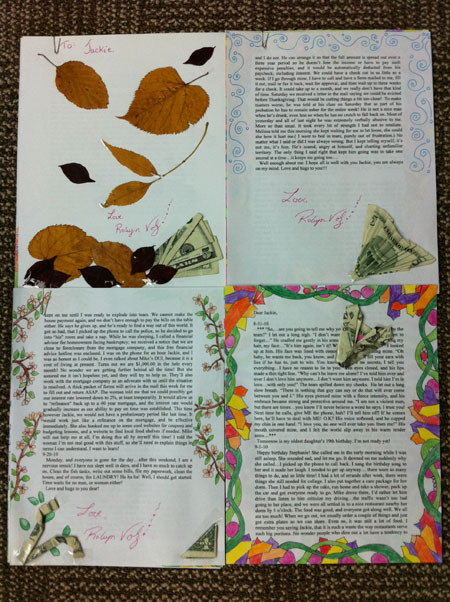 Several people sent drawings in formats that were unreadable or had corrupted files. We will do our best to post all designs. Jackie will choose his favorites and the winners will be announced on his websites and on his Facebook page. 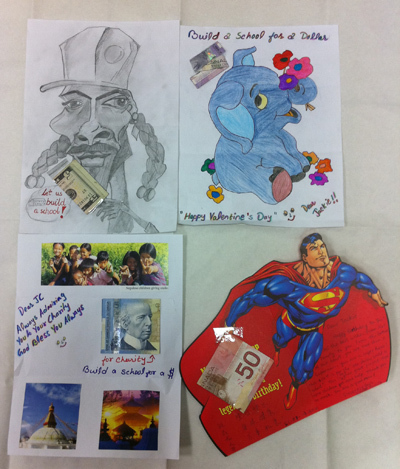 See the First Entries in Jackie's Happy Chinese New Year Contest! It's Time for Jackie's Happy Chinese New Year Contest! 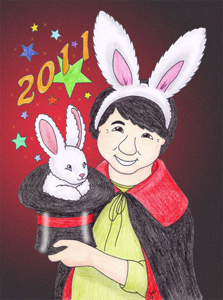 The Chinese New Year of the Rabbit is coming up and to celebrate we are having another Happy Chinese New Year contest. In the past this has been one of the most popular contests at the Kids Corner. There will be nine prizes in three separate categories. Each winner will receive a t-shirt autographed by Jackie. The contest starts now and ends on Feb. 2 at midnight, just in time for the Year of the Rabbit on Feb. 3. 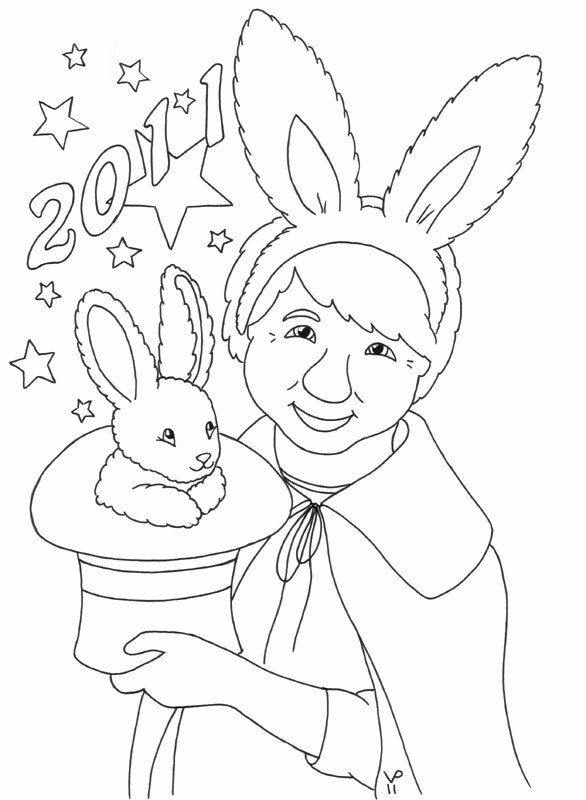 Kids Corner cartoonist Petra Vogel has designed a wonderful new coloring project to celebrate the Chinese New Year of the Rabbit. 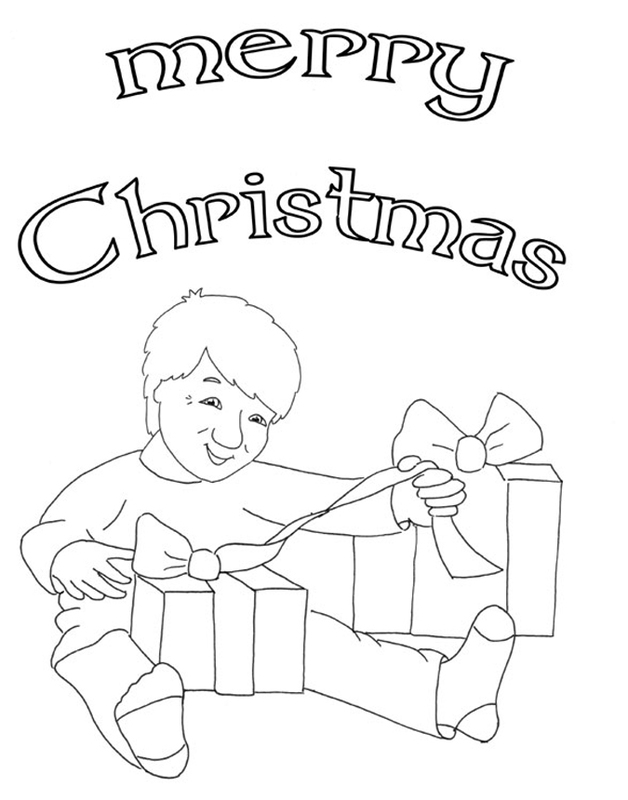 Click on the image to print out and color in your own picture! 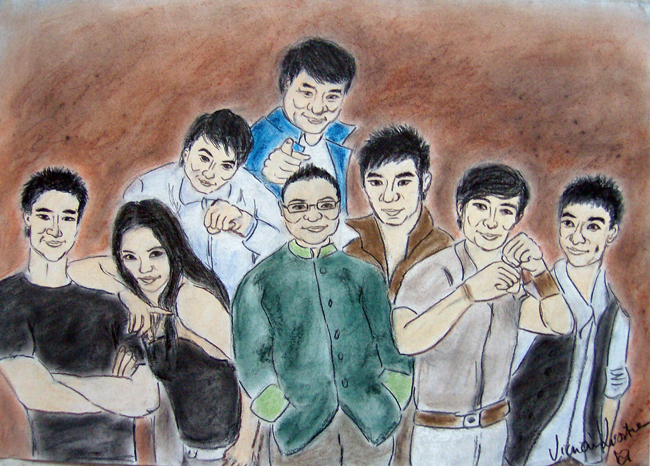 This is how Petra colored hers, but you can add your own personal touch to the drawing! Jackie Has Chosen the Holiday Contest Winners! 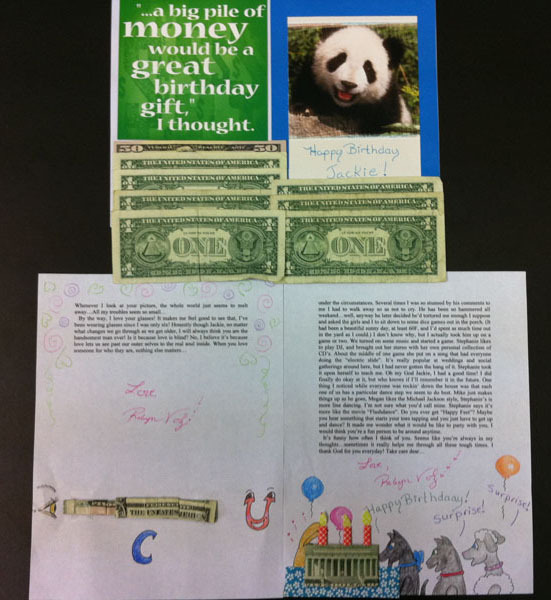 It was a tough job, but Jackie has chosen the winners in our first Chan La and Chan Zy Holiday Contest. We have included photos of Jackie judging the contest on our winners' page (click banner below). 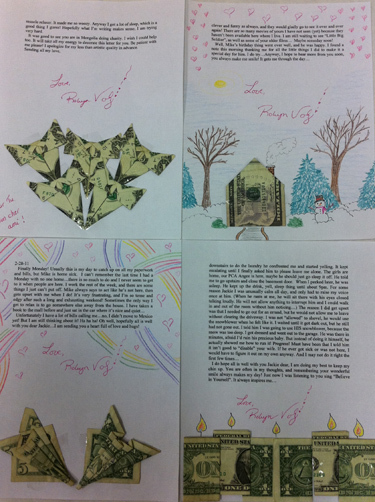 Originally there were to be only three winners, but Jackie liked the designs so much that he chose THREE of his favorite designs in each age category. Each of three winners was to receive a photo of Jackie, but since he added more winners, there will be six additional prizes. Only three winners will receive the photo; the others will receive different items. With nearly 200 entries from 46 countries around the world, the Chan La and Chan Zy Holiday Contest has proven to be one of the most popular contests we've ever run here at the Kids Corner. Because so many people entered, we have added more prizes. In addition to the three top prizes in three age groups, we will be awarding prizes for the three second place winners and the three third place winners in each category! Thank you to everyone who entered. 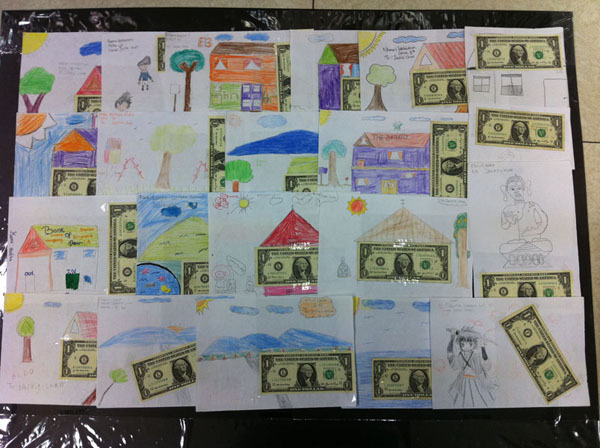 This contest attracted people of all ages, from senior citizens to little children. Jackie will have a hard job to pick the winners from so many beautiful designs. 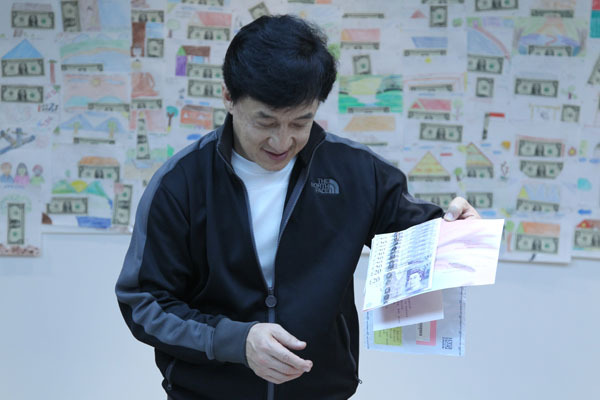 We will announce the winners on JackieChan.com and on Jackie's Official Facebook page here. 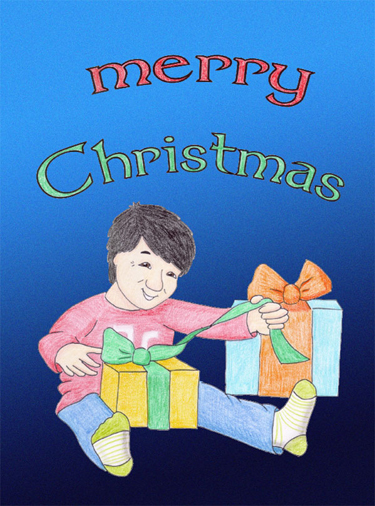 Our old friend Kriszti from Hungary has made a special Christmas card for Jackie and all his fans featuring Jackie and his Lucky Seven. Thanks Kriszti! Holiday Contest a Big Hit! 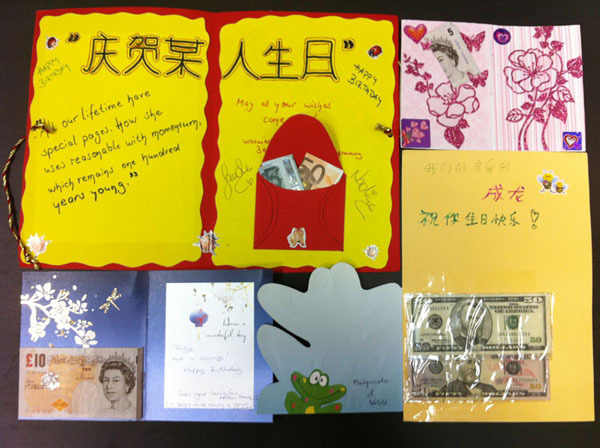 Over 150 fans from 46 countries around the world have entered the Chan La and Chan Zy Holiday Contest! Thanks to everyone who entered. There is still time to enter the contest; entries will be accepted until midnight of December 20 (that's today!) so hurry and send your entry. 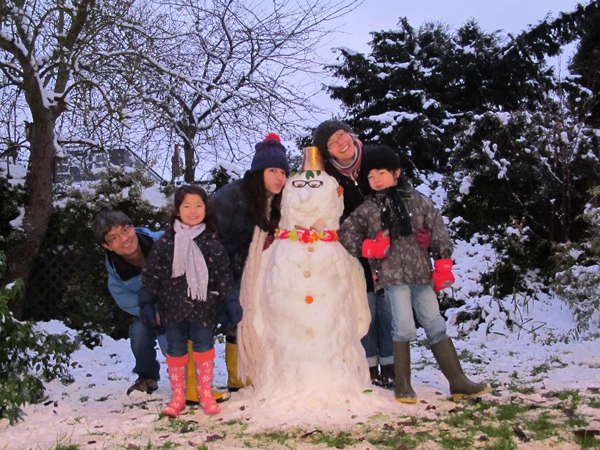 Several children from one family in the UK sent entries, and then they sent along a photo of their family. 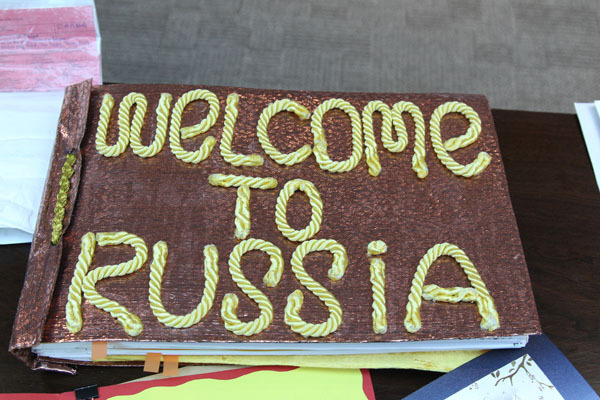 We'd like to share it with you! 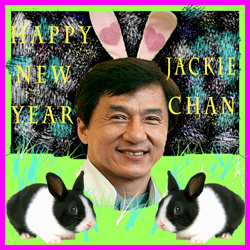 It's that time of year again - - time for a Jackie Chan coloring project from our artist-in-residence, Petra! Just click on the picture of Jackie to link to a page that you can print and color for your friends and family. Thanks to Petra for another brilliant coloring project! And don't forget Chan La and Chan Zy's Holiday Contest! You still have plenty of time to join in on the fun and maybe you'll win an autographed photo of Jackie! Proving once again that Jackie's fans are the most creative people in the world, unique and beautiful holiday designs have been arriving in our email box daily. Keep sending them in! You have plenty of time to draw or paint your design and mail it to us. Thank you to everyone for naming your files as suggested. It makes the webmaster's job a lot easier and prevents duplicates from being posted. One note: Please don't send your design in over and over again. It takes a few days to post the entries, and resending your design is confusing for us. If you believe that your design is missing, please send it again, but give us a chance to post it first. All designs sent in through December 10th are now posted. Thanks! The "Jackie and Brandon Christmas Tree"
Wow! Only one day since the contest was announced and we already have a dozen cute entries in the Chan La and Chan Zy Holiday Contest! Click here to see them. Announcing a Great New Holiday Contest! 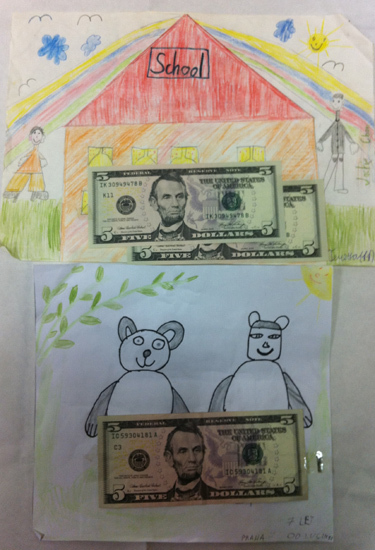 Since it's the pandas' first holiday, we decided to have a fun and easy contest here at the Kids Corner. This contest is for kids of all ages and there will be three great prizes for three lucky winners. 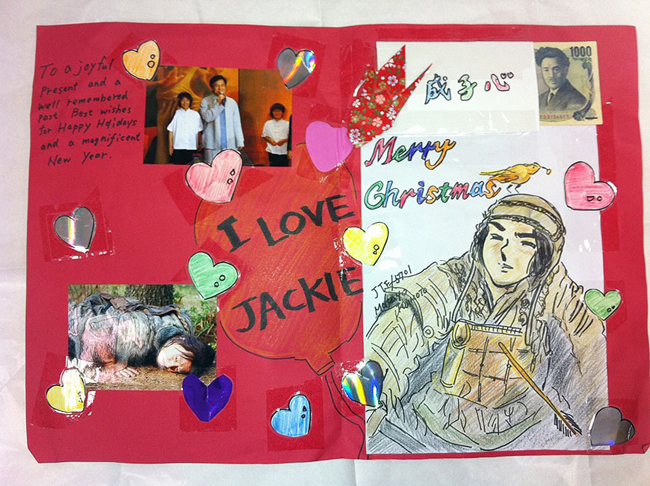 The Kids Corner has been updated with drawings, stories, and creations sent in by Jackie's fans over the past few months. Check out the new stories at the Sharing Corner, new drawings in the Art Gallery and Jackie Caricature sections, great Photoshop projects and over a dozen new Buddy Bears. Here's one cute drawing sent to the Kids Corner. Thanks to everyone who sent in a story or drawing. Jackie loves to see how talented his fans are! Slowly but surely, Jackie's fans are contributing to the Build a School for a Dollar fundraiser and now the total is up to over US$18,000! 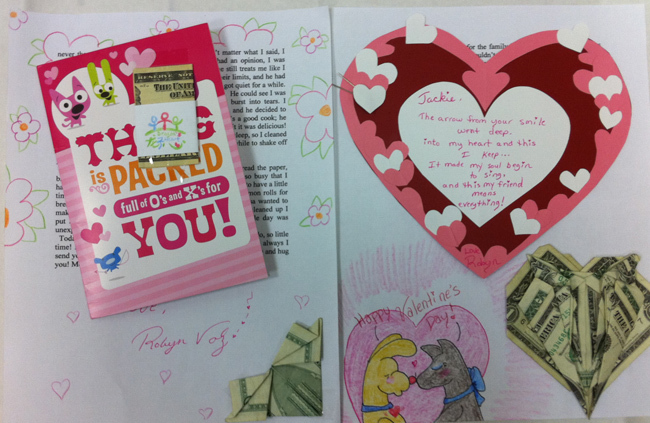 Thanks to everyone who contributed and please continue to support Jackie's favorite charity. 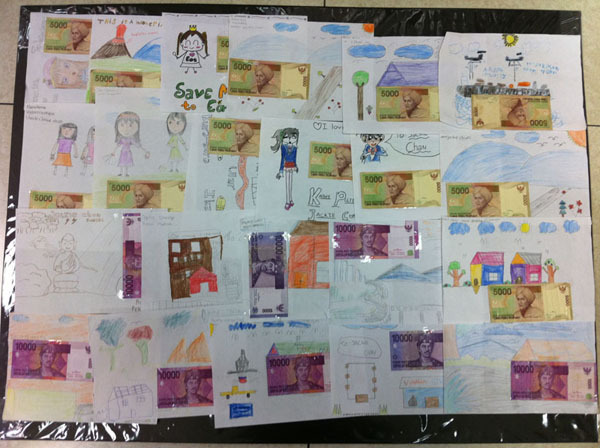 Here are a few photos of Build a School designs sent in by fans. If you would like to send in your design, click here for instructions! As you know, Jackie travels all over the world filming movies and working for charity. 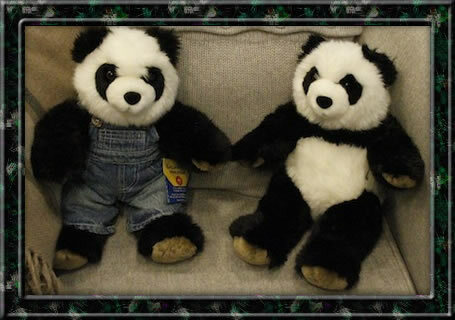 His faithful pandas, La and Zy, follow him everywhere and never miss a chance to get their photo taken. Click the little bear below to see the newest photos of La and Zy on their amazing adventure. Lots of Updates at the Kids Corner! Jackie's little panda friends have been very busy. Click the little bear below to see the latest photos! Click below to read a fan's story of a group of friends who gathered to raise money for the Build a School for a Dollar project. Travel through the USA with Chan La and Chan Zy! Chan La and Zy have been traveling through the United States with Jackie's assistant. Visit their photo album to see all their new adventures! Happy Birthday Chan La and Chan Zy! 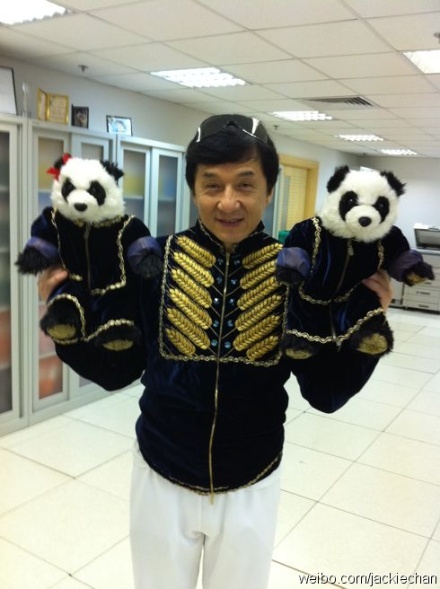 To celebrate the one month birthday of Jackie's pandas, we give you a wonderful photo of the proud papa with his babies. 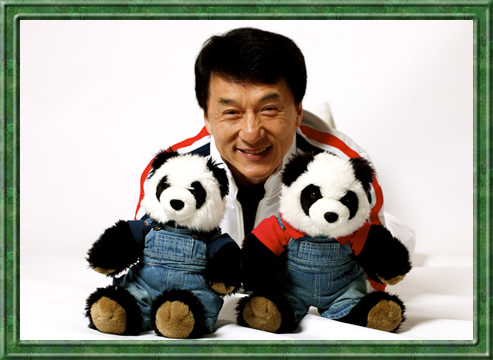 Jackie will take the pandas, named Chan La and Chan Zy, around the world with him and eventually will auction them off for charity. You can follow their adventures here on the Kids Corner! Everyone knows about Jackie's two little friends, Chan La and Chan Zy. Now you can view an album of photos from their travels! Click here to see all the places that the bears have visited so far. Meet Chan La and Chan Zy! Read about a fun new project that Jackie has just started. 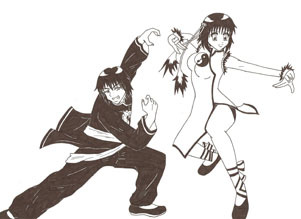 Click on the photo of Chan La and Chan Zy below! 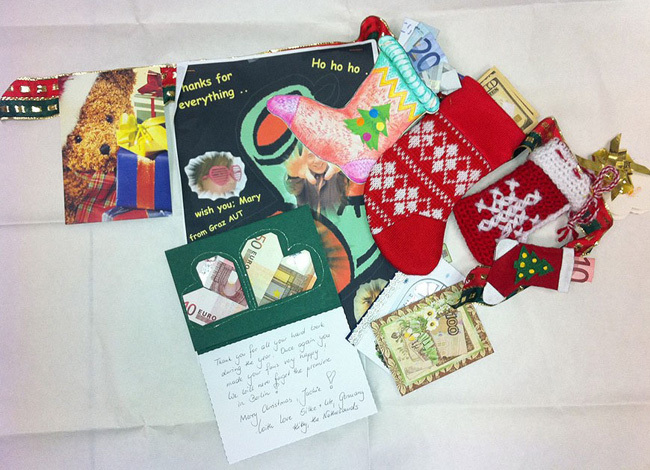 A big thank you from Jackie for all the donations you've been sending to the office and through the online donation page. 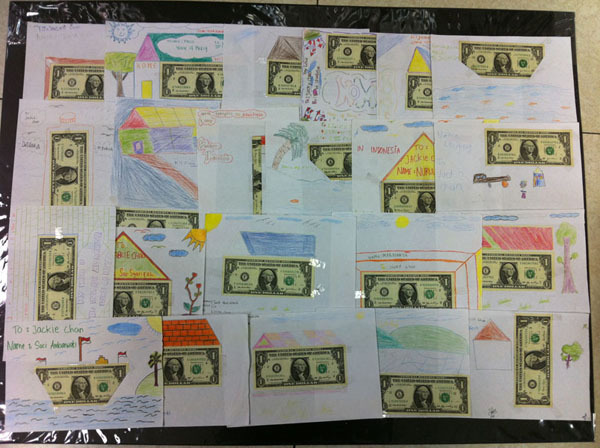 Since our last update in May, fans have sent in an incredible US $5,609 for Jackie's Build a School for a Dollar charity. As you know, Jackie matches each and every donation, so that means the total has jumped over $11,000 in only two months! 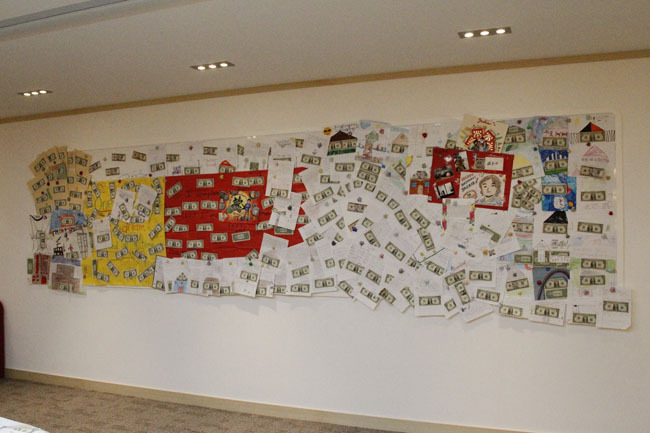 Jackie recently stopped by the office in Hong Kong and there was a big surprise waiting for him - - all of your donation drawings laid out for him to see. After he left we photographed them individually and you can see them here. For directions on what to do to make a donation drawing, click here. 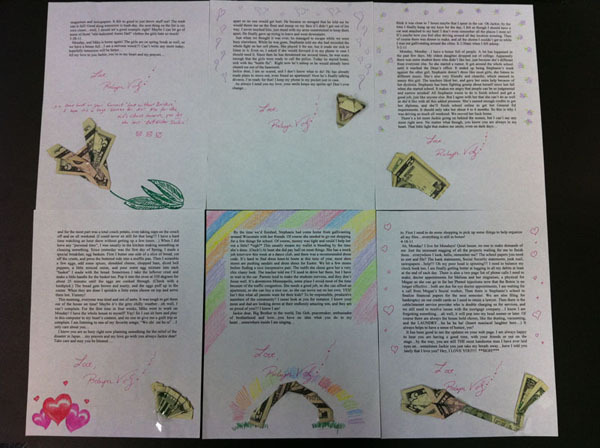 Jackie's pet project, the "Build a School for a Dollar" is still going strong, with fans donating another chunk of money these past few months. Jackie sends a special thank you to all of his fans who have continued to support this project over the years and encourages everyone to do their best to donate whatever they can. Thank you to our old friend Raoni from France for this beautiful drawing of Jackie! We've also added new projects to our Photoshop Jackie page. Take a look! Second Build a School Goal Reached! We have reached our second Build a School for a Dollar goal! 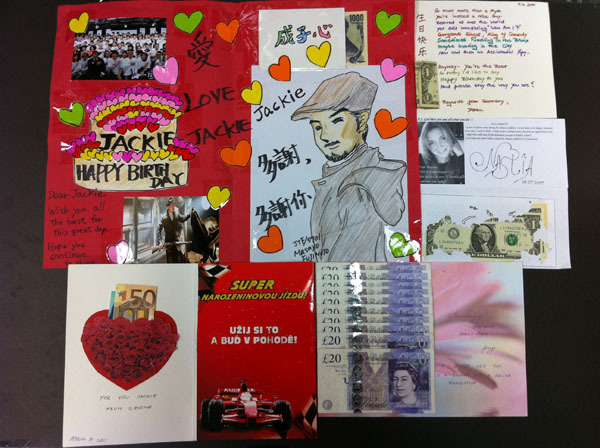 In less than four years, Jackie's fans have sent in a total of more than US $75,000. 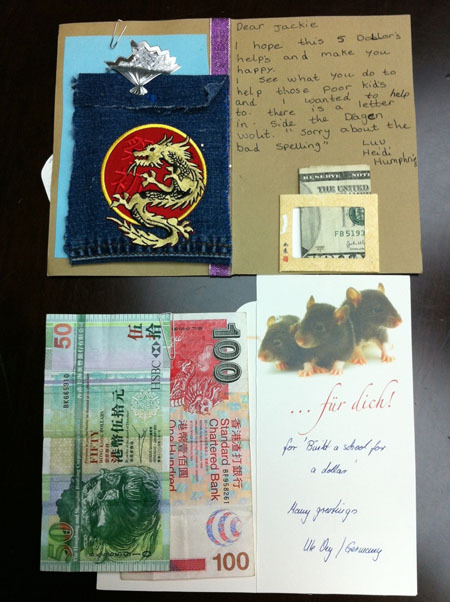 With Jackie's matching donation, that's enough money to build two Dragon's Heart Schools in remote areas of China. Thank you and congratulations to everyone who supported this project! 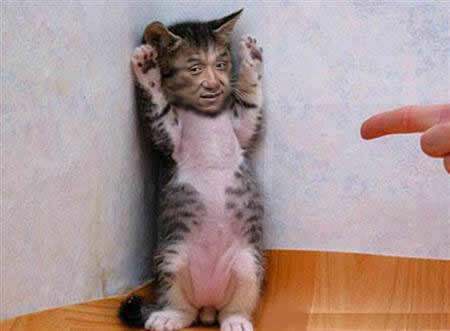 Click on Bad Jackie Kitty to see lots of new Photoshop projects! Thanks to Exaggerate.com for sending us a terrific Jackie caricature. To see more, click here.